The first year we did this in 2003, we had 75 registered bikes and ended up riding that day with only 37 bikes. Then in 2004, the numbers doubled with 150 registered and just over 75 bikes on the ride. In 2005 the numbers went up again with 250 registered we ended up riding with about 150 and in 2006 With over 270 registered riders, added to the members who rode, we were able to take more than 300 bikes. In 2006, due to crappy weather, we missed or goal. 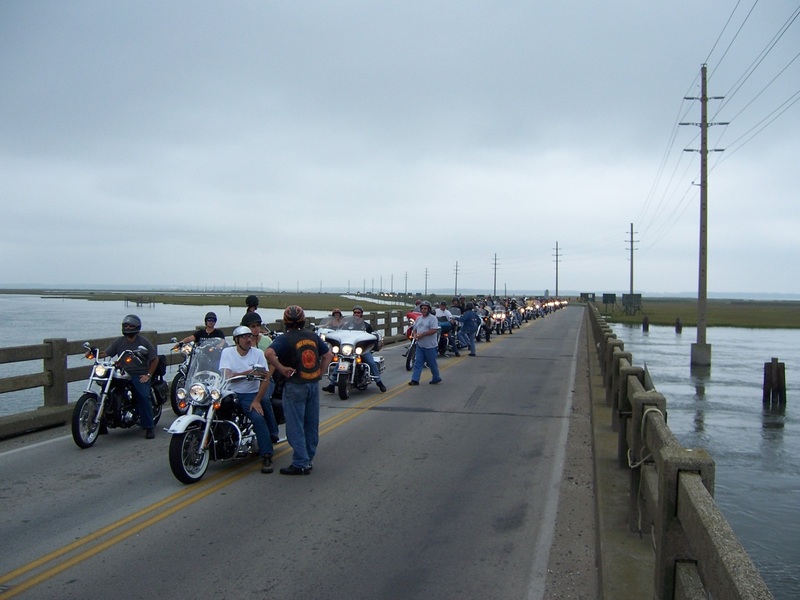 We did ride, but with 192 registered, only 148 braved the “on again off again rain” and rode with us to Chincoteague. THEN in 2007 we made up for it all! With NEARLY 550 registered, we rode with just a mess! We really never got a full head count but the numbers were unbelievable. The Maryland State Police reported that there was close to a 19 mile line of bikes that stretched from Bay Street in Berlin to Route 12 in Snow Hill. We have heard that folks counted and we have received numbers anywhere from 500 to 750. Who knows…..? All we know is that it is lots of fun and we meet plenty of really great people who just want to get out and ride! If you have suggestions or comments about the ride we would like to hear from you. Just drop us an email.